I am fortunate to have great friends at Bootleg Biology. In May, Jeff Mello and Isaac Brannon returned five lactic acid bacteria (LAB) isolates from a variety of local yeast project captures I sent them earlier in the year. Each isolate was evaluated in the Foraged Bacteria Pilot Batch (blog post forthcoming) and my favorites were combined to brew a wort-soured beer. The only remaining question was . . . which recipe should I brew? Many of my homebrewed beers are inspired by commercial examples, but not all. Occasionally, experiences and/or people evoke a recipe. Such instances are rare, but wholly authentic – a mélange of senses at a specific place in time. Unfortunately, transcribing experience to recipe is often my greatest challenge. The uniqueness of the LAB isolates and the warming summer weather seemed like the perfect combination for deriving a genuine recipe. Ever since I can remember, summer has been synonymous with Cape Cod and its quaint towns, seafood shacks, lighthouses, and ocean beaches. Countless days and nights spent at my grandfather’s summer cottage have solidified my affection for the Cape. But above all, one place in particular epitomizes summer on the Cape – Coast Guard Beach. It was a lazy beach day at Coast Guard in July that fueled my inspiration for my latest recipe. Sitting, reclined in my chair, I could feel the warmth of the yellow sun, see the frothy crashing waves, smell the briny sea water, and taste the tart lemonade in-hand. My senses were pointing to one single beer – Gose! 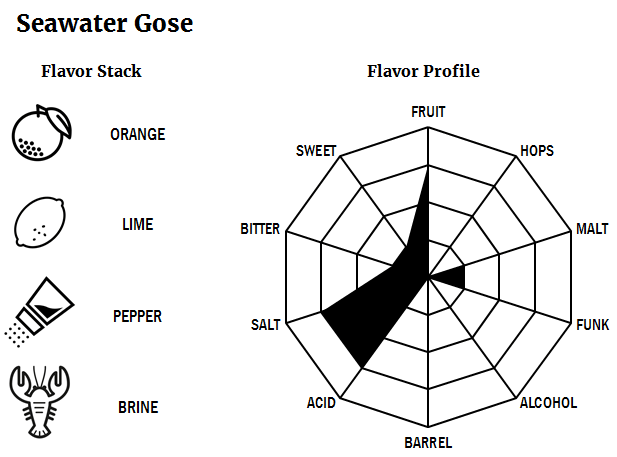 Gose is a top-fermented sour wheat beer flavored with coriander and salt. It was first brewed during the 18th century in Goslar and (soon after) Leipzig, Germany. WWII was unforgiving to Gose, sparking a decline in popularity and production until completely vanishing in the 1960s. Gose reemerged 20 years later, in the 1980s, but was not fully revived until the 2000s. Today, de Garde Brewing, Stillwater Artisanal Ales, Westbrook Brewing Co., and Lost Nation Brewing produce some of the most revered examples of Gose in the United States. Beyond utilizing my newly acquired LAB and Atlantic seawater for acidity and salinity, respectively, I had little idea of how to start building a Gose recipe. In times like these, I often turn to Milk The Funk, a communal authority on alternative yeast and bacteria fermentation. I used their Gose recipe and technique as a starting point, with some modifications. During brew day for Table Ale #3, I diverted one gallon of wort (at start of boil) into a glass carboy. I cooled the wort to 95°F and then co-pitched the LAB isolates. Using the combination of my BCS and crock-pot as an incubator, I maintained wort temperature for 25 hours, until pH reached 3.38. I removed the carboy from the heat source and allowed it to free fall to ambient temperature. The next morning, I pitched my house yeast. I left the Gose to ferment and condition for five weeks. *On average, seawater has a salinity of 3.5% (35 g/L or 132.5 g/gal). For breweries that use seawater; salt (g/gal) = seawater (%) x 132.5 g/gal. When bottling day finally arrived, I combined 1 c. of unfiltered seawater and 1 oz. of freshly cracked coriander seed in a small saucepan. After 15 minutes, I poured 10 ml into a graduated cylinder. Next, I transferred 100 ml of Gose into a second graduated cylinder. I proceeded to blend the seawater/coriander to the Gose in 1 ml increments until I reached my preferred salinity level. Despite using more seawater (salt) than the commercial examples, I felt 4.7% seawater tasted best. Some quick arithmetic revealed a total scaled up blending volume of 6 oz/gal of seawater to Gose, respectively. After blending, I pitched some fresh house yeast and enough dextrose to prime to 3 volumes. One month later I cracked open the first bottle. Appearance – A beautifully bright champagne hue compliments a moderate hazy appearance and its vibrant, foamy head quickly fades within the first minute. Smell – Initial aroma reveals a clean lactic acidity with undertones of cracked black pepper. Some minerality is present in the nose but overall the aroma is restrained. After a few minutes, while the beer warms, I can detect (subtle, non-offensive) notes of rubber. Taste – Citrus for days! I get huge waves of orange, lemon, and lime fruits. The citrus overwhelms the salt until the beer hits the back of the palate. Overall, the seawater is not overwhelmingly briny, but rather complementary. There is appropriate acidity – not too sour or too mild. Mouthfeel – As intended, the mouthfeel is medium/medium-low, making it perfect for a summer session beer. The higher carbonation level helps keep the body light and refreshing. Makes for a great beach beer! Overall – Despite having no experience brewing Gose or using wild LAB isolates and seawater in beer, this was a huge success! I was able to produce a tart, crisp, flavorful Gose with an assertive salinity and appopriate mouthfeel/body, without coming off tasting like Sprite. I am happy to say this homebrewed Gose held its own against several excellent commerical examples, but even happier to have created a Gose with terroir – a sense of Cape Cod! Changes for Next Time – For those who tend to prefer Gose with lower salt levels, I would recommend lowing the seawater from 4% to 2%. I plan to experiment with Pacific seawater and several different foraged LAB isolates next time I brew his recipe for an added twist (keep your eyes peeled for a future compare-and-contrast blog post!). In addition, I would like to split future batches, reserving half for fruit (raspberry, apricot, lime, etc) since this base recipe lends itself nicely to bright fruit flavors.